It starts from Ulquiorra’s flashbacks. The opening page is Ulquiorra. The scene goes back to Yammy. The huge reaitsu from above fades away. Yammy: Ahh… I was trying to help you, but you got beaten up in the end. At number 10 of Yammy, 1 disappears and leaves only 0. 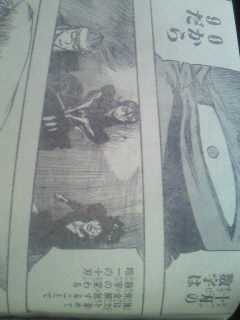 I’m a Espada whose number is changed after the release!! Who said Espada is number 1-10? Three of them are astronished. So a captain is someone like this. It’s your time to die. Bleach 354 Spoiler available now, We will update this page as soon as the Bleach 354 scanlation is release. If you would like to discuss the spoilers or predictions, please leave a comment below. You can also download previous Bleach 354 manga chapter. Trivia bleach 354 spoiler : Hollow Ichigo has stated that he doesn’t know what he is. This could mean he might not even be a hollow, but something in between a Hollow, a Shinigami, a Vizard and an Arrancar. Also, he shows some of the ordinary Hollow characteristics, like the black eyes, but he neither has a hole nor a mask. Also, despite him being a hollow, Hollow Ichigo performs Shikai and Bankai much like a Shinigami, a feat that not even the Espada can accomplish. This is likely due to the fact that he was created in the very same moment as Ichigo reacquired his Shinigami powers after losing them during his first fight with Byakuya Kuchiki. As none of the inner Hollows of the rest of the Vizards was yet shown, it could be that he is a unique being. It starts from Ulquiorra's flashbacks. I'm a Espada whose number is changed after the release!! So a captain is someone like this. It's your time to die.